Recognized by the CBEC vide F.No.B.12017/15/2005-Ad.IV A dated 4th March 2010. Recognition renewed for further 5 years from 04.03.2012 vide Govt. of India, Ministry of Finance, Department of Revenue, CBEC's Letter F.No.B.12017/03/2013-AD.IV.A. dtd. 01.05.2013. I hope that by now, you have finalized your travel schedule to attend the All Gujarat Convention in Ahmedabad on 23rd January, 2016. 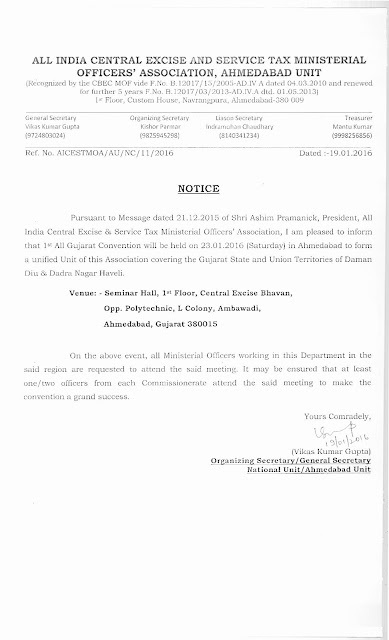 The Special Meeting of the All India Body will also be held simultaneously. The comrades in Ahmedabad as well as other parts of Gujarat are trying to make a grand success. 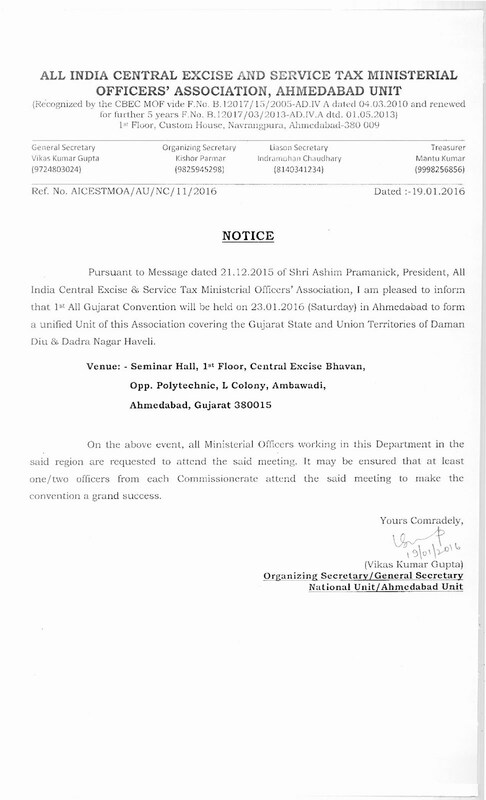 So once again I appeal our Comrades of different cities, all over the state of Gujarat and Union Teritorries of Daman Diu and Dadra Nagar Haveli to attend the Gujarat Convention to form a unified committee for this region. Notice, in this regard, is given below for your reference.